The infamous forum cut off cookies meets a four way junction of kush's she sure creates road blocks wherever she goes. 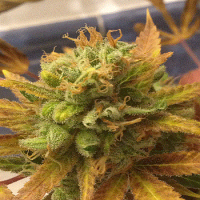 London Cookies Regular Cannabis Seeds by Holy Smoke Seeds: The infamous forum cut off cookies meets a four way junction of kush's she sure creates road blocks wherever she goes. 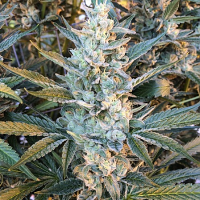 Man is she strong we love combining small amounts of sativa into our hybrids when you get it right the effects are devastating. 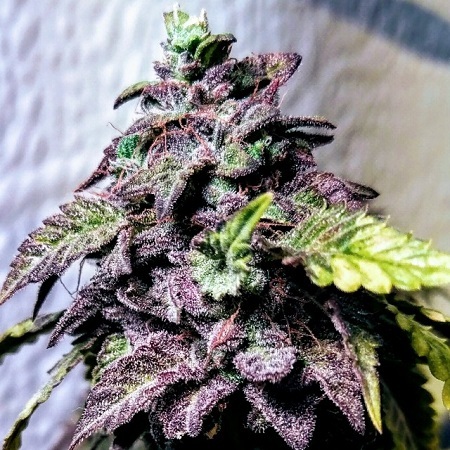 Beautiful large dark cookie and gas nuggs gleaming valleys of trichomes with massive globules on the ends, yep this is where the effect stems from. The terpenes here will range from like a pack of wild horses around your system digging new ground as it sows its seeds of progress, this is a stronger smoke than most people are going to be used to so the hit is brutally strong, you're going to sweat for sure as it rages round your body breaking down all barriers and ceilings from even just a little psychoactive Durban influence from the cookies, and then supported by the huge Kush dozer which parts way in its determination. A gorgeous rock solid stone truly one of our stronger strains to date! It's an instant high, the psychoactive Durban sets the roller coaster off into initial free fall, but with the gravity of the kushes keeping you clearly aloft to enjoy the most wonderful effects of this stone. The purples from the forum cut still shine through with red and magenta as she finishes adding some exceptional bag appeal, and the flavour is truly on point with shelves, layers of stone in its Arsenal as the guide resounds with a huge scope of depth and clarity you'll be immersed in and supported by the most beautiful pipe sound over the valley as the highwire in the London Cookies brings you constant new views, it's so special and so much fun we wanted the London cookies a bit special and they truly live up to their name - such fire Inside these cookies you're gonna love them!